Here are wren house plans you can easily follow to make your very own wren bird house. If you use the specifications outlined in these bird house plans, you will increase your chances of attracting wrens to use the nest box. 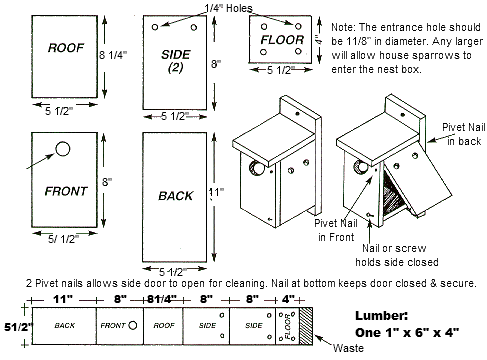 One of the most important design elements in building any bird house is the hole size. 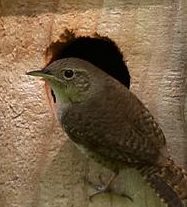 The hole diameter will determine who or who cannot use your wren nest box. For House Wrens, Winter Wrens and Bewick's Wrens, you can make the hole diameter 1 1/8" which is also large enough for black-capped chickadees. A 1 1/4" hole will allow Carolina Wrens and White-breasted Nuthatches to use the box, but also will allow unwanted house sparrows to enter as well. Other species of wrens such as marsh wrens, sedge wrens, cactus wrens, and canyon wrens are not likely to use a nest box. 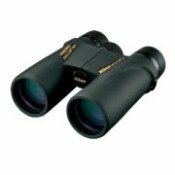 I have found wide variation on hole sizes required for different wren species from 1 1/8" to 1 1/2" needed. If house sparrows are not an issue in your area, then you may want to start with a bigger hole size, such as 1 1/4", otherwise stick with the 1 1/8" hole. 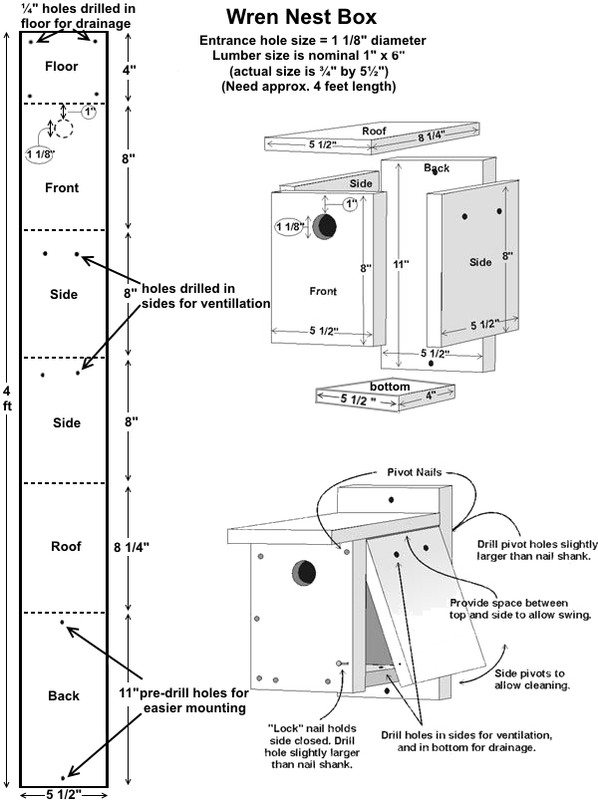 Below is a wren bird house plan from the Natural Resources Conservation Service. A more detailed view is provided from the MN DNR further below (see highlighted arrow next to small image). Be sure to mount your wren birdhouse where predators such as cats, snakes or raccoons cannot easily reach the nest box and have access to the adults or nestlings. Do not add a perch to the box because this will allow birds such as starlings to land. You can place the nest box from these wren house plans 5-10 feet above the ground, under the eaves of a building or a tree limb. 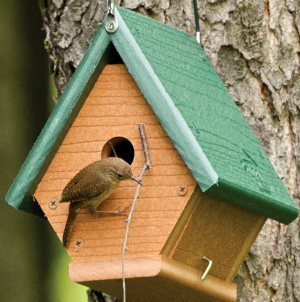 Wren boxes can also be firmly fixed to the side of a building or tree or can be hung freely from a wire. Carolina wrens prefer a house that is more hidden, like around shrubs or trees, than exposed and in a wide open space. We have seen wrens build nests in hanging plant baskets and even in the mouth of an old flounder skeleton that was mounted on the outside wall of a shed! 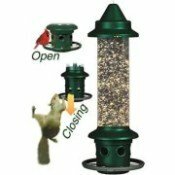 To attract wrens to your backyard and to ultimately use your bird house, place suet, peanut butter or meal worms in nearby feeders. <-Here is another more detailed diagram for wren houses from the Minnesota Division of Natural Resources. Click on the small thumbnail image to view larger plans in a new window. You can then print the plans using your browser or save the image to your computer to view or print at a later time. Note: House wrens can become very territorial and aggressive during the breeding and nesting season. So much that they have become a problem for those who wish to have other cavity nesters such as bluebirds nesting in their bird houses. Note: Bluebird lovers have gone to long lengths trying to discourage house wrens from using bluebird boxes. House wrens will often destroy bluebird eggs, remove them from the nest and then proceed to use the nest box for themselves. But there has also been documentation of both bluebirds and house wrens living peacefully in coexistence. Just a note for you to ponder in case your bluebird-loving neighbors go postal on you when they find out you are building a wren house. But if you want wrens, go for it! Wrens are cool little birds and should be enjoyed too.